It's the end of another fine year for Leeds music, but don't worry I'm not going to bore you with a load of self indulgent lists whilst there's still lots of great stuff being released and promoted. Several artists that I’ve mentioned before have been busy in studios readying new releases. The first being Paul Thomas Saunders who is set for a memorable 2012 when his debut album is released in the spring. In the meantime, in true prolific form, he is releasing another EP in early 2012 entitled 'Descartes Highlands' - and if you bob over to his website there's a sample track of airy, electronic bliss to be had from it for free. Next are Post War Glamour Girls who only recently had a very triumphant single launch, but are back already with new release Suburban Barbarian. It’s a slower, smoother track that has echoes of Wild Beasts at their most sultry whilst maintaining plenty of originality. The Wind-Up Birds have put their name into the Santa hat for the bitterest Christmas song. ‘Working Christmas Day’ is an anthem for those with a dislike of the 25th December, which makes Fairytale of New York seem like a beaming ray of sunshine. Have a listen here, all donations received will be passed to Barnardo's. A few weeks back Halifax's Wot Gorilla released a free download only single named 'is'. It's an excitable slice of math-rock, who's soft vocals and kaleidoscopic rhythms are reminiscent of an early Tubelord. Champions of all things noisy in Leeds, Brew, delivered an ear pummelling combo on 12th December with a single release from new signings Blacklisters and an EP from Hawk Eyes (who I have mentioned before on here when they were known as Chickenhawk). Blacklisters' release is a download single entitled 'I Can Confirm' with accompanying screenprints and t-shirts from Drew Millward. Hawk Eye's release is an EP called Mindhammer, from which the below track 'Crack Another One' is taken. Both releases possess enough terrifying, in-your-face raw power to ensure your family worry about you over the holidays should they hear you listening, and these songs deserve to be played loud, so make your grandparents worry. Hookworms' record has finally had a proper vinyl release, seek it out as they are one of the most exciting bands to emerge from Leeds in recent times, and wiped the floor with several much more well known names at last months Constellations Festival. As did Eagulls, who at the time of writing are on a tour of Europe with Iceage, and if you're not yet familiar with the band then you really should acquaint yourself via this interview with Dom Gourlay. As if this wasn't good enough reason to visit anyway, the site is encouraging donations for local organisation Simon on the Streets and at the time of writing has earned them £135. So visit the site, enjoy the songs, and dig deep into those pockets. Hi Matt, it’s been another busy year for Jumbo Records what have been your highlights? I think our 40th Birthday (yes Jumbo has been around for that long!) was excellent, and also Record Store Day which involved us putting on some damn fine bands. This years Leeds International Film Festival was another incredible hotpot of goodies with some great music films. There have been some really great DIY festivals on too and the same goes for next year. There's way too much going on in this city to keep up! How do you feel about the current health of the Leeds music scene in comparison to past years? It's very much as healthy as it ever was - Leeds always has a strange draw of continuous talent, that either involves musicians replenishing the productive pool (lots of students, Leeds College Of Music, and some fantastic talent from the surrounding) or the fact that the live scene is so strong for local talent and scenes. It very much works on all levels, whether it's a traditional folk jam at the Grove, a clutch of electronica artists experimenting round a house in LS6, or a jazz jam in the Sela. It's healthy and more importantly, it's pretty much the norm to see and hear all these styles around (which also influences musicians too). I'd pretty much say that the focus has gone towards either folk or electronica as far as the Leeds has gone, but with some rather noticable exceptions in the punk and indie scenes, plus jazz/funk. Slightly further afield we love the Wilful Missing's new album, and anything on the Philophobia label. There are WAY too many favourites to list and I'm sure by the time the article goes to print we'll have thought of double the amount we've listed here, but that's the beauty of it, there's just so many interesting things going on in the local scene. In terms of local releases what have been the staff favourites this year? Phew! Now that's a hard one for sure - personally I think there have been some extremely strong releases from all quarters of the music scene to be honest. To pick just a tiny amount that come to mind I think both the Skank Agenda and Acid Drop albums have been pretty inspiring as far as punk attitude go and have caught the wave of feeling against the horrible Thatcherite consumer hell we live in right now. Electronica wise we have the some wonderful soundscapes by Ithaca Trio (who incidentally did a special sound recording for our 40th Birthday), and also Stormloop and the odd-core tronics of Gaye Device. Indie-wise Just Handshakes (We're British), The Whatevers and This Many Boyfriends have made a real impact as have Eagulls, not to mention the folk/country brilliance of Serious Sam Barrett. Ellen And The Escapades keep going from strength to strength and we enjoyed Gary Stewart's solo offering and also Rosie Doonan and Sam Airey too. There have also been some great hip-hop albums like the No Pretense and even the excellent Ariya Astrobeat Arkestra has proved the Leeds can do Afrobeat with the best of them. …and which local releases have been popular with Jumbo’s customers? It's always a pleasure to see not just family and friends buying local releases, and some of the best ones have flown out across the board. We've had not just shop sales, but mail order from all over the world for the Serious Sam Barrett EP , Ithaca Trio, Eagulls, Ellen And The Escapades plus shop plays have yielded a lot of new fans for The Whatevers and Gaye Device. What forthcoming releases from Leeds artists that you’re really anticipating? Well, Serious Sam Barrett and Ellen And The Escapades both have forthcoming albums out next year and we've been lucky enough to hear some tracks and I'll eat my hat if they don't prove to be MASSIVE next year. 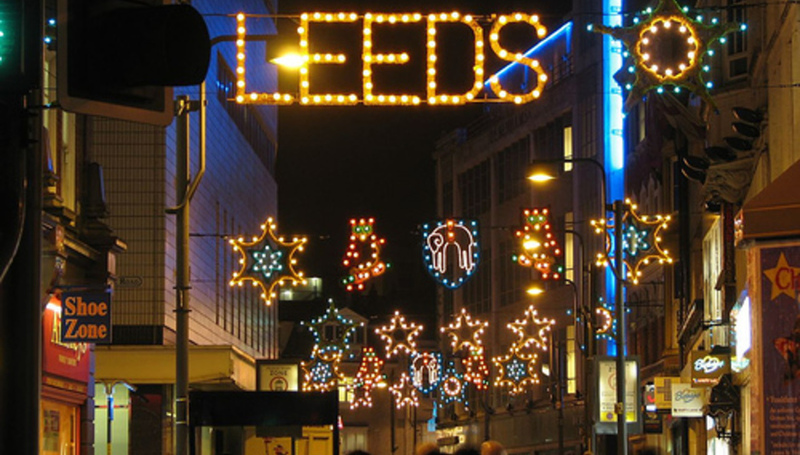 Are there any forthcoming Leeds gigs that you are looking forward to? The below playlist features some of the artists Matt mentioned above. It includes a demo of a new Just Handshakes (We're British) song, a track from No Pretense's horror themed EP, Ellen & the Escapades last single, and ends with a soundscape created by Ithaca Trio crafted from recordings taken in the shop during their birthday week that will transport you straight back there. Remember though Leeds is blessed with two great records stores; there is also Crash Records on the Headrow, who we also hope to speak with at some point in 2012.